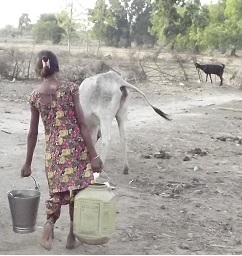 Satna/Rewa: When we met Vidyavati, 11, at back-in-the-beyond Paragtola settlement (Dhuman panchayat) in tribal-dominated Java block of Rewa, the frail girl was panting heavily and sweating in harsh middle-May sun, two large containers of water placed at her feet. Trying to speak to Vidyavati was doubly difficult. She’s obviously a shy girl and at that point of time did not have enough breath to respond. But though we felt deeply troubled by her condition, the little girl’s face was unusually calm. The fact that she had to heave the two heavy containers of water from almost 1.5km distance under mid-day harsh Sun did not bother her apparently. After all, it is her routine almost three to four times every day. Drought has hit Baghelkhand (northeastern part of MP) during past two years in unprecedented manner and the worst hit are vulnerable sections like children, women and elderly people, especially with most able bodied males having migrated for work. Having to heave water for long distances, chipping in to other manual labour in harsh summer season and eating nothing but chapatti and salt every day, these vulnerable people are literally living life on the edge. Most people have not seen daal for over a year now and the only vegetable most can afford is potato, that too not more than twice a week. Mid-day meal at schools and food at anganwadis inclusive mainly of chapatti or rice with watery daal or potato curry is the only succor for children. But in some settlements like Dabhoura Basti of Rewa, even this food supply is irregular. Examples of the hardships and extreme conditions are obvious at all corners of Rewa and Satna districts. Most people in Java block of Rewa and Majhgawan of Satna lost Kharif crop due to poor rain and did not sow Rabi crop at all. The ground water levels have plunged to extreme and thus hand pumps and wells have given up, forcing people to travel 1-3 km to get water. With little or no work under rural employment guarantee scheme (MNREGS), irregular payments of social security and disability pensions, people are edge of life. Women, children and elderly are bearing much of the brunt. 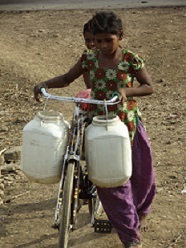 About 40km away from Paragtola, in Owari village of Bausad Panchayat, class 4 student Rita Yadav, spends two-hours twice every day to help her mother and aunt collect enough water to drink and for domestic work. Kusma of Kaimaha (Mahtain Panchayat, Satna) had to work as a labourer till eighth month of her pregnancy at neighbouring Chitrakoot (UP) breaking boulders, so that her family back home could sustain. She gave birth to a girl child a month ago at home, without any antenatal care or vaccination. She plans to join her husband back in Chitrakoot as soon as possible. In Tagarpar of Satna, elderly Sumitra has to give eight to nine hours collecting Tendu leaves and then bundling them, to get wage of about Rs 125 per day. “I have no other option after crops failed,” she says. The health indices related to children and women are not so good in the poverty stricken districts. N Rewa 36.2% children are underweight and 40.4% are stunted (National Family Health Survey-4). In Satna the figures are 39.6% and 41.2%. Rewa recorded 11 maternal deaths in 2014-15, while Satna recorded 35 according to state health department records. Experts feel that the health and nutrition conditions would only worsen because of the continuing drought situation. Satna collector Naresh Pal however says that the government was aware of drought situation and making all possible efforts for ensuring drinking water and work to people.